Click on 'More info' to see more pictures and to check availability on any of our listed Clare Castle Country Park cottages. Click 'Add to favourites' to store any of the Clare Castle Country Park cottages for later viewing. We look forward to welcoming you to have a peaceful self-catering holiday in the ground floor, self contained annexe of our home. Wildlife is abundant..
A luxury bijou cottage set in the heart of the historic Suffolk market town of Hadleigh, St. Mary’s Cottage is a Grade II listed building that dates.. The accommodation of this pretty cottage comprises of one double bedroom and two single bedrooms. The fith bed is a pullout if needed,The bathroom is ..
A former water pumping station, the Pump House is situated in its own water meadow with river frontage in an area of 'Outstanding Natural Beauty'. 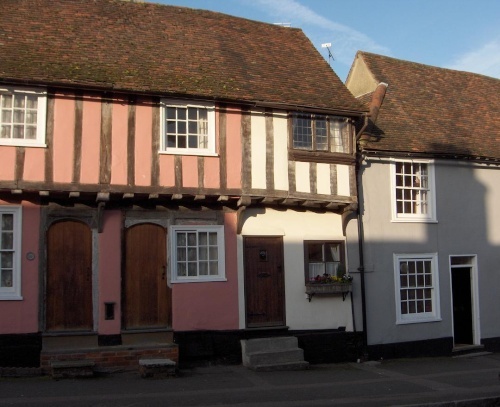 Foo..
Toppesfield Cottages are proud to present: Cherry Tree Cottage, Bower House Tye, Polstead, Nr Hadleigh, SuffolkCherry Tree Cottage offers luxury in th..
A 16th Century cottage situated along a quiet street in the heart of the ancient market town of Saffron Walden. The cottage has all the modern comfort..